My New Etsy Store and A Giveaway!!! So, in honor of my grand opening LOL, I am offering a gift set as some blog candy! 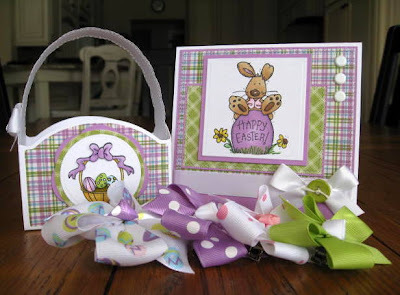 You will get the card and basket that I made the other day, as well as these 4 coordinating hair bows! To enter, just leave a comment on this post telling me what you think of my new store! I will draw a winner on Friday. Have a fabulous rest of your weekend! Oh my goodness. These are soo cute. I love the bows, so great for a little girl and the matching gift box and card are great. Thanks for a chance to win. OK I totally want to win because I want these for my daughter - LOL Just checked out your store - that's awesome. You're gonna make some serious money, girl. I don't have anything ready for my blog in the morning, so Imma put this on there - LOL Good luck! Kerri, this is a wonderful idea and I wish you well! My 'little girl' is 21 (going on 22 next month), so I'm afraid the hair bows aren't on my shopping list. LOL! Even when she was little, I'd fix her hair with cute bows, head bands, etc. and she would jerk them off her head within a few minutes! I will keep your Etsy store in mind for gifts for others...I love unique, handmade gifts! Wow Kerri, these are gorgeous and I KNOW it will sell like hotcakes! Congrats on opening your Etsy shop! Kerri these are lovely. Your esty store is FAB. I love the coordinating card, box, and hair bows. I didn't know you made hair bows - they are fabulous! Your shop looks great and the five projects you have for sale already are amazing. I am sure you will sell them all in no time at all. Your gift sets are so beautiful!! I'm sure you are going to be very busy keeping up with orders, good luck!! Your new store is just awesome - I love how you have packaged your sets together! I wish you all the best and I'm keeping my fingers crossed on this awesome Easter set! I have added your candy to my sidebar at Create With Joy - please stop by and say hello when you have a moment! Congratulations, Kerri!! Your work is always fabulous and I know your shop will be a success. 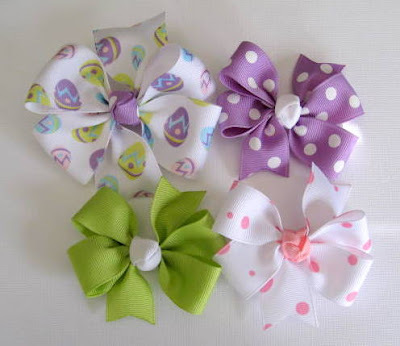 What little girl wouldn't love these sweet bows for her hair. So adorable!! congratulations on your etsy store Kerri..i love all of your items in your shop. but will you ever ship outside the USA..i am sure there a lot of people worldwide would love the chance to purchase your creations. AWW Kerri these are fabulous...Congrats on your store gf!!!!!!! LOVE those bows too..wow you rock sweetie! Hi Kerri!! I am making one of these baskets right now. Yours is so stunning!! I just love your colors and the set you created!! You rock girl!! Congrats on the store!! Your bows are beautiful!! Gorgeous colors and design, Kerri! Congrats on your store opening! Beautifully done! What a great idea, all of your work is awesome, good luck with your new store! Congratulations on the new adventure in your life, so happy for you, Kerri! Beautiful set and the bows are so adorable!!! Oh Kerri! What adorable hair bows. I can't wait for my daughters hair to get long enough for hair bows. I will order some from you for sure. CUTE CUTE CUTE!! I love the combo packs. They are so cute and any little girl would fall in love with them. Congrats Kerri! What a wonderful idea - I love your hair bow gift sets!!! My 14-month-old granddaughter's hair is getting there! In a few months, she'll be ready for your wonderful creations. Adore the gift sets. I hope many other grandmas, mommas, and aunties patronize your etsy shop! So adorable! My friend sells these in her baby store where I sell my cards and I immediately thought, oh! Kerri could sell her bows here! Um no...she bought them from some wholesale place in Texas for like $0.25 a piece...so not worth your time! These are fabulous though, and I love your Etsy. You've inspired me to start my own!